With winter holidays quickly approaching, you’re bound to get a bit homesick. When you receive an invite to visit a new friend’s home, it’s best to be prepared in order for you to gain a good rep, increasing your chances for future invitations. 1) Bring a gift:Can’t go wrong with fruit, nuts, sweets or tea. If possible, bringing a specialty from your home country would particularly be a hit! Remember not to bring items in fours, since the number four is unlucky in China, as it sounds the same as the word for death. 2) Don’t wear your shoes inside the home. They’ll either have a spare pair of slippers or plastic baggies to fit over your shoes. 3) Sit where you are asked to seat, for seating is well thought out in regards to age and honor. Wait to dig in until you are asked to start. 4) Toasting is quite a bit different than in other cultures. Instead of a single cheers at the start of a meal, there are cheers throughout the meal in the name of different causes. A “ganbei” to health follows a “ganbei” to friendship. Usually one person at the table chooses another to participate in the ganbei, rather than the usual participation of the entire group. 5) Toughen up and be adventurous. For example, if fish is served, you’ll most likely be served the head as the honored guest. If you let it sit there on your plate untouched, you risk offending the entire table. If you really do not want to end up with the head, serve it up to another person at the table before they have the chance to serve it to you. Once again, you could risk offending your hosts if you refuse to sample their food. Your host will pile food onto your plate, and will continue to do so until you stop eating everything. If you are full, leaving some food on your plate will most likely cease the non-stop serving. It’s usual for there to be lots of leftovers, symbolizing the generosity and wealth of the host. 6) Compliment the Chef. There’s a good chance the better part of the day was spent preparing this meal. Dinner conversation mainly revolves the food itself. Conversations have more depth following the meal, perhaps over a tea and a smoke. gān bēi (干杯): Cheers, bottoms up! Since most home-cooked meals do not come with a menu, you’re on your own for this one! However, if conversation comes to a halt, pulling out and sharing Waigo will surely create some entertainment. Have your hosts write down their favorite dishes on a piece of paper and then have them use Waigo to learn the titles in English. Attention! If you’ve been zoning out, wake up because this is the most important part: when in doubt of what to do, look around and follow the leads of your hosts: slurp when they slurp, sit when they sit, ganbei when they ganbei, etc. Now it’s time to go make some pengyou (friends) so you can use this newly acquired knowledge. 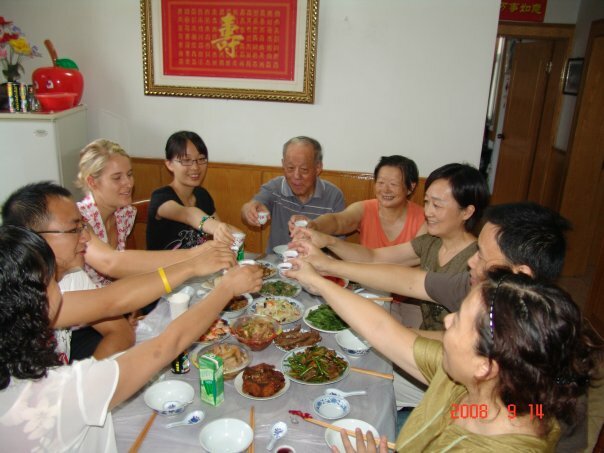 Shouldn’t be difficult as Chinese people are typically super interested in making friends with foreigners. I was blown away with the genuine curiosity from the Chinese people while living in China in getting to know me and my culture.